Ah… it’s that time of the year again. The crisp autumn air. Yellow, orange, and red leaves gently cascading in seemingly ceaseless perpetuity. Snug ugly sweaters and steaming hot pumpkin liquids. Then, before you realize it, the annual American November event barrels through, where citizens try to beat their record amount of unhealthfulness with an unabashedly insensitive display of savage gluttony. Thanksgiving, without fail, conjures up images of butter heaps and creamed potatoes, roasted turkey orifices freshly stuffed with bread loaves, and endless platters of casseroles adorned with nonessential somethings all colored like fall somehow. With such a strong tradition of engorgement, what’s an American expat to do for Thanksgiving in Spain? Can’t watch all these leaves cascade forever. Well, actually, they do celebrate Thanksgiving. And not just once a year – every week. Whether you believe the pilgrim origin lie or not (highly suggested reading: Lies My Teacher Told Me and 1491), we can all agree Thanksgiving is supposed to be about getting together with immediate family and relatives. There is a generous feast as the centerpiece and we are all around thankful for everything and everyone despite our differences. So according to that definition, Spaniards give thanks every Sunday. Including with grandparents, aunts, uncles, and in-laws. Lunch is the main meal here – get outta here with your evening sup. When the holidays roll around, the principal at my job here teaching English in Madrid blusters into the staff room demanding everyone’s participation at the upcoming holiday meal. We’re given two choices: comida or cena (lunch or dinner). Comida literally means food or meal, but it’s no coincidence that the same word is used to signify the main meal here which is eaten around 2pm. Often, you’ll be asked if you have eaten yet, meaning if you’ve had lunch. Dinner is much smaller, and breakfast is practically nonexistent. First plates in a 3 course lunch menu – just another Wednesday in Madrid. However, Sunday lunches are more lavish affairs, with nicer than usual meals and lots of time spent sitting and talking even after everyone has finished eating. This post-meal event has its own name: sobremesa. This occurs without fail after all meals – whether you’re in a restaurant or at home. The Spanish are aghast when they hear that no such thing exists in the US, and that servers will bring you an unsolicited check as soon as you’ve finished eating (sometimes even before). In Spain they won’t bring it unless you ask and doing otherwise would be considered extremely rude. Making time for family and friends isn’t some annual special event that requires obedience and a pat on the back once done. In Spain, you’ll be hard-pressed to make a date for lunch more than a couple days in advance. Here, spending time with friends and family is a priority. Back in New York, I’d have to make plans at least two weeks in advance or expect someone to be unavailable. New Yorkers will cry BUT WE’RE SO BUSY, but so is everyone else. It’s about priorities. So when you do make plans with someone in Spain, invariably it will involve a meal, as socializing and eating go hand in hand. Spain doesn’t need an occasion to sit down for a meal. Every meal is a sit down one, often with wine, eaten in a relaxed and unhurried manner. Take away is not a thing here (although that’s changing). For example, take away coffee is rare unless you’re at a specialty coffee shop. Fine with us, as this reduces paper cup waste. If we really need a coffee to go at an airport or train station, we bring our own reusable cup. Spaniards find it abhorrent that people eat on the go, or in front of their computer at work. That’s also why street food isn’t popular here. I’ll admit I miss the street food aspect of New York. But it’s a small tradeoff for luxurious several course meals that I can actually afford and paradoxically aren’t seen as a luxury. Delicious, quality, comfort food is the norm here. Thanksgiving is about stacking plates on plates of comfort food like stuffing, sweet potato casserole, pumpkin pie, and mashed potatoes. It’s a time to put away the TV dinners and Seamless and eat a solid, home-cooked meal. Spaniards don’t need a special day for this because quality homemade food is the norm. Fresh baked bread is also the norm. We get our favorite loaf for 50 cents! I love the food in Spain. While you can find overpriced garbage near the tourist attractions, residents regularly eat out and expect food to be minimally processed and maximally comforting. Whether it’s the main meal around 2 pm, or tapas later that night, there is no lack of options. I don’t think there’s a block that doesn’t have a bar or a restaurant. And speaking of bars – they serve food too. Virtually anything that sells drinks also makes food, and if they make food, they probably sell drinks. There are cafeterías, cervecerías, churrerías, cafés, wine bars, restaurants, tavernas – the list goes on. The similarities outweigh the differences. A cafetería always has food, coffee, juice, and usually alcohol. So does a cervecería, but they tend to have taps more freely flowing. Maybe they have limited wine, so a wine bar is your next stop for a more extensive selection. They’ll most definitely serve some food too. Well, you see my point. If you’re all about food choices, go to a restaurant, of course. That you rarely find drinks without bites and vice versa is a testament to the food culture here and the importance they place on it. Can’t really say the same for many American cities, as any long-term New York resident will admit to you the all too often shameful schlep to health code friendly dumpsters that sling your “probably tastes like garbage if I was sober” drunk munchie meal. Maybe what America needs is holidays like this more often. I would personally be in favor of America adding more feast meals to the holiday calendar. Or impressing some sort of monthly or (gasp) weekly family tradition. Of course, the Sam and I still have nostalgia for a proper Thanksgiving, but even this most American of holidays is in constant revision. Case in point: last weekend we attended a vegan potluck Thanksgiving in Madrid with people we have never met before and it was quite the success. I dare anyone to call that un-American. It’s not that the Spanish tradition doesn’t suffice – quite the contrary as I aforementioned. No matter how much we search for alternatives to the rampant consumerism culture readily exported by America, there’s one fact I can’t escape. I’m American first and foremost, and I can’t spend Thanksgiving day without some form of gluttony. Has all this talk about food piqued your Spain culinary interest? Check out these other posts. Vegan Menú del Día. You know what’s more important to Spaniards than tapas? The main meal, of course. And this is not just Sunday, but every day in the afternoon. Don’t miss out on this uniquely Spanish tradition. Vegan Tapas Guide to Madrid. Of course who hasn’t heard of tapas? Well, you may not have known just how extensive the vegan options are. Here we give our favorites after many repeated visits. Ultimate Vegan Guide to Madrid. Online guides don’t get more thorough than this. 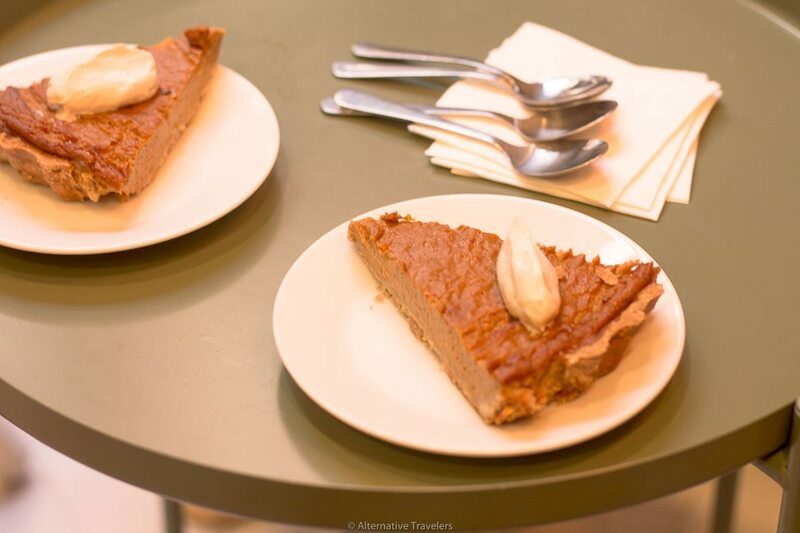 For a complete compilation of all what vegan Madrid has to offer – look no further. Alternative Travelers’ Vegan Madrid Guidebook. With FIVE times the word count of our Ultimate Guide, this book literally guides you through the expansive vegan Madrid scene, with tons more details, includng maps and exclusive insider info – unless you think you can best 3 years of research on your trip to Madrid. Guide to Visiting Madrid’s Main Sights (for free and cheap of course)!